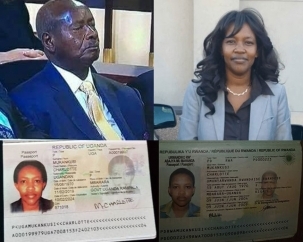 Uganda’s President Museveni seems to have been rattled by the revelation that he had hosted RNC officials and that he had issued its head of diplomacy, Charlotte Mukankusi – a dissident former Rwandan diplomat – with a new Ugandan passport. In a damage control-induced haste, Museveni wrote a letter to the media that was presumably intended for President Kagame. The fact that he had to backdate the letter to show that he had written it before issuing the passport is one thing, it is quite another that his haste damage control antics ended up aggravating the original damage, by inducing him to reveal even more than he would have wanted. A letter that reads so much like a confession shows that he is so deeply invested into the RNC project, he would rather risk sounding absurd than consider cutting that damaging relationship. It is difficult to imagine a situation where anyone – let alone representatives of an armed dissident group from another country – can simply walk in on a head of state of a neighbouring country unannounced, without prior appointment. Perhaps even Museveni’s own children don’t enjoy this level of privileged access. Much as he acknowledges that the RNC officials “wanted us to support them” in their plans “to resist Your Excellency,” he doesn’t question how come it is from him the dissidents believe they can find comfort and why it is to him they feel they can come without any risk with plans to destabilise their country? He writes that he said “no” to the request from his ‘accidental’ visitors for support to destabilise Rwanda. However, since Museveni’s exchange with them suggests that he also buys into their view that “bad things are happening in Rwanda,” it is unlikely that his response was as negative as he would like us to believe. Specifically, Museveni is on record promising the RNC more support once they have merged with the FDLR – the remnants of the forces that committed the 1994 Genocide and unrepentantly consider it an unfinished project – and begin to destroy Rwanda’s infrastructure (for army, security, and government). In his letter to the press (which he nominally addresses to Rwandan President Paul Kagame), Museveni claims not to have known who Eugene Gasana – Rwanda’s former ambassador to the United Nations and another active RNC member – was. Equally amazing is that Museveni had claimed not to know Tribert Rujugiro and David Himbara, respectively the RNC chief financier and his publicist. However, on more than one occasion, he has come to admit to knowing people he had previously denied knowing until evidence is presented to him that his denials are patently untrue. For President Museveni, everything is apparently an accident. Even the fact that Rujugiro is financing the RNC from the proceeds of his business interests in Uganda might be accidental. This is why it is not clear to him whether Rujugiro has accepted to close down operations in Uganda or he is still “resisting,” whatever that means. Remarkably, Museveni seems to support Rujugiro in this famous resistance, “even if he sells the factories in Uganda, he still has more lucrative factories in Angola, DR Congo, etc., a total of eight of them. He can send money from those,” he labours on, explaining Rujugiro’s different sources of income when his concern as a head of state ought to be to ensure someone who uses such income to destabilise a neighbouring country should be stopped. Did Museveni expect Rujugiro to admit that money from his business interests was financing terrorism? Surely not. This is diversionary rhetoric on his part that only serves to justify the presence in Uganda of people bent on destabilising Rwanda – and that he is prepared to defend them. On the one hand, Museveni is acting like he is the courts. On the other, he directs Rwanda to go to the courts. At any rate, if he has not “confirmed” that the Rwandans he holds extra-judicially are “agents,” shouldn’t he be setting them free? Indeed, if he can act without confirmation, why is he hesitating to do so when it comes to Rujugiro? Museveni’s letter is important because at least he admits that RNC officials do in fact visit him, even if, he insists, they don’t stay long. “All these people left Uganda after only a few days,” his self-immolation continues. “As I told you when we met, there is no question of Uganda supporting anti-Rwanda elements,” Museveni writes as if to confirm the obvious. This is rich. In other words, even as he admits that the RNC is “operating” in Uganda, he says this is happening without his support. Is he now asking us to believe he has no control over what happens in Uganda? And yet, not a day passes without him reminding everyone that no one can destabilise Uganda because he is in control. Going by the trend, one may confidently predict Museveni’s next letter will ask Rwanda to prove why he supports the RNC – not whether he does. Former Inspector General of Police (IGP), Gen Kale Kayihura, was on Friday charged with one count of “aiding and abetting kidnap from Uganda” of three Rwandan nationals and two counts of “failing to protect war materials”. The charge of aiding and abetting the kidnap of Rwandan nationals from Uganda and handing them over to Rwanda has more significance than just what will transpire inside the General Court Martial (GCM) when or if the case goes through full trial. The men who were kidnapped from Uganda and handed over to Rwanda, especially Lt Joel Mutabazi, who was a bodyguard of Rwanda president Paul Kagame for decades, are significant. The others over whose kidnap and handover to Rwanda Gen Kayihura was charged with on Friday, are Mr Jackson Karemera alias Ndiga and Sgt Innocent Kalisa. The events leading to the kidnap and its aftermath pointed to a dip in Uganda-Rwanda relations, which have been lukewarm since the armies of the two countries clashed in DR Congo. Suspicions then ensued, with the two governments suspecting each other of harbouring intentions of overthrowing the other. There is no evidence to show these suspicions have been buried. At the height of the fallout, political dissidents would escape from one of the two countries to another, and vice versa. Regarding the charges that were read for Gen Kayihura on Friday, it is alleged that between 2012 and 2016, by omission and commission, the then IGP aided and abetted the actions of subordinate police officers and others on various occasions, without hindrance, to kidnap and illegally repatriated Rwandan exiles and refugees. Gen Kayihura is the most senior government official to be charged for the 2013 kidnapping of Rwandan refugees and Asylum seekers. The army court has in recent months charged and remanded a number of people, some senior police officers, over the kidnap of the trio. 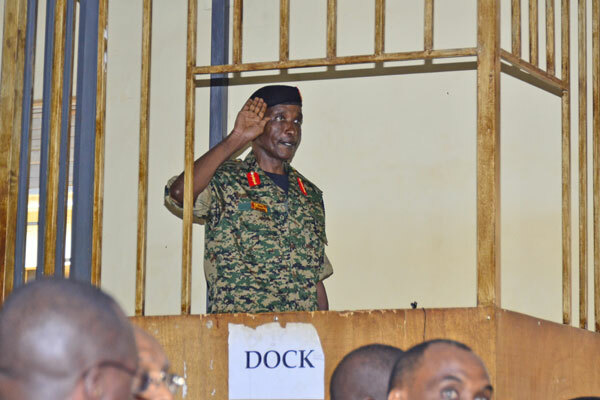 The others currently facing charges before the military court are Mr Nixon Agasirwe, formerly said to be a close ally of Gen Kayihura, who got assigned a number of important duties, and Mr Joel Aguma, formerly the commandant of the police’s Professional Standard Unit (PSU). The others charged in this regard are Benon Atwebembeire, Abel Tumukunde, James Magada, Faisal Katende and Amon Kwarisima. On the charge sheet is also a Rwandan, Rwene Rutagungira, and Pacifique Bahati Mugenga aka Ilunga Monga, a Congolese. Apart from the kidnappings and repatriation to Rwanda of the trio, a number of Rwandan refugees in Uganda reported threats to their lives in Uganda and many had to be resettled in other countries, especially after the shooting to death in December 2011 in Kampala of Charles Ingabire, a journalist who was running an online publication in Kinyarwanda, which was critical of the Kagame regime. Many of the Rwandans who were relocated claimed that the security forces in Uganda, particularly Uganda Police Force, which was then under Gen Kayihura, did not offer them sufficient protection. The soldier. Lt Joel Mutabazi served as Mr Kagame’s bodyguard. He is currently serving a life sentence in Rwanda after he was convicted of being an accomplice in grenade attacks that killed two people in Kigali and plotting to assassinate the president. Mutabazi, together with Joseph Nshimiyimana, were also found guilty of plotting to kill president Kagame in collaboration with the Rwanda National Congress, an opposition group based in South Africa. The group allegedly offered the men $50,000 (about Shs190m) to support the plot. The trial was conducted by a military court. Mutabazi was one of 16 people on trial, including three of his relatives, who were jailed for between four and eight months. Though Mutabazi appealed the sentence saying he had been kidnapped, little has been heard of him since. The kidnap. Mutabazi was first kidnapped on the evening of August 20, 2013 from UNIK Hotel in Kyaliwajjala, near Kampala. The kidnappers used a fake Interpol arrest warrant, alleging that Mutabazi, together with two other individuals, were involved in an armed robbery at Banque De Kigali in September 2011. During the kidnap ordeal, an unidentified group of armed men stormed his hotel room and whisked him away in a white Ipsum car Reg. No. UAK 551B. He was detained at Jinja Road Police Station from where it was discovered that he was under the protection of the Ugandan Government and United Nations High Commission for Refugees (UNHCR). The illegal extradition to Rwanda was aborted at Entebbe airport after State Minister for Disaster Preparedness Musa Ecweru presented formal documents of his asylum. Mutabazi’s luck ran out when he was kidnapped again in October 2013 in Mpigi District after a pursuit by the Uganda police. The next time he was heard of, he was in the hands of the Rwandan police a few days later. Coming to Uganda. Mutabazi had escaped from Rwanda in 2011, where he had been detained by the country’s intelligence services for 17 months and sought asylum in Uganda. On arrival in Uganda, attempts were made on his life. On July 12, 2012, Lt Mutabazi escaped unhurt after someone shot into his house in Kasangati. After the narrow escape, Mutabazi took refuge at Kasangati police station from where he was rescued by UNHCR. After the Kasangati attack, Mutabazi applied to UNHCR to be transferred to another country but the request had not materialised by the time he was kidnapped. Joining the army. Private Innocent Kaliisa, No. AP987709, joined the Rwanda Patriotic Army in 2001. He underwent basic military training and was posted in the Rwanda Presidential Protection Unit. Coming to Uganda. According to those known to him, Kaliisa came to Uganda on a mission to kidnap and take Joel Mutabazi back to Rwanda from where he had escaped. However, when he arrived in Kampala, Kaliisa allegedly went against his boss’ instructions. Both Kaliisa and Mutabazi had undergone specialised commando training in preparation for their job to guard the Rwandan president. Kaliisa instead allegedly turned himself in and told the police in Uganda all that had happened. The kidnap. Kaliisa was kidnapped in Kampala on August 12, 2013 and whisked to an unknown location. Before his kidnap, Kaliisa, who served under the Rwandan Presidential Protection Unit of the Republican Guard Division before fleeing to Uganda in 2010, expressed fears about his safety in an interview with the New York Times. Kaliisa claimed that he was living under constant fear after being tortured in Rwanda over his alleged connection to opposition elements. The then UNHCR Country Representative, Mohammed Abdi Adar, requested government to conduct an investigation on the whereabouts of Kaliisa. Kaliisa was a close friend of Charles Ingabire, a former editor of Inyenyeri, an online publication who was shot dead in Kampala in December 2011. A bank branch building on the African city street. The imposing building of the headquarters of this African bank in Kampala, Uganda. When Dfcu Bank shot to Number Three bank in Uganda, there was a party mood among some of its investors, but the celebration is being cut shot with a major investor pulling out of the union. 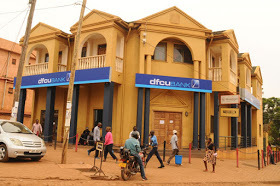 Dfcu controversially acquired Crane Bank, which made its profit margin jump through the roof, but, the aftermath has left a rotten egg on the face of the commercial bank as well as Bank of Uganda, which might affect its international investors’ reputation in the near future. After the ugly truths about the deal emerged, many shareholders were not happy that DFCU did not follow corporate governance laws to the letter. For example, it emerged that Bank of Uganda and DFCU signed a secrecy agreement never to disclosure the contents of the deal which involved the sale of Crane bank at a pantry Sh200 billion. Whereas Crane bank shareholders were left of the negotiations and never got a penny after the sale, it has also emerged that Dfcu’s top management did not fully disclose to its shareholders the details of the business. The financial sector the world over has become overly monitored with cases of lack of transparency and proper accountability, severely punished. Case in point are accounting and audit giants KPMG and PwC who are to pay heavy fines for failure to carry out due diligence in the course of advising their clients before sale of stakes, which is linked to fraud. Just this week, PriceWaterhouseCoopers (PWC) has been slapped with a record breaking fine $625 million (appro.sh2,437,500,000,000)for their negligence which led to one of the largest banks, Alabama’s Colonial Bank to collapse in the US state of Alabama. Analysts say, this is one of largest-ever awards for accounting malpractice. Now, the tsunami has risen out of the seemingly calm sea. Many questions are rising why a major and oldest investor, CDC which set up shop in 1964 in the country and has been with the bank since 2000 is opting out, when the prospects of making more money with DFCU are high. Chimpreports website reported that on June 14 2018, CDC wrote to Dfcu’s top management, announcing plans to sale its stake, and possibly end the relationship. The owners of Dfcu include Arise BV (majority shareholder with 58.71% ownership), CDC Group of the United Kingdom (9.97%), National Social Security Fund (Uganda)-7.69%, Kimberlite Frontier Africa Naster Fund (6.15%), SSB-Conrad N. Hilton Foundation (0.98%), Vanderbilt University (0.87%) and Blakeney Management (0.63%). As well as Bank of Uganda Staff Retirement Benefits Scheme (0.59%), Retail investors (11.19%) and two undisclosed Institutional Investors (3.22%). With almost 10%, some industry observers say Dfcu might not significantly feel the shock since its majority shareholder Arise B.V would absorb the transition. However, the implication on the investor confidence of the bank is significant, as well as the wealth of expertise that will walk away with CDC. Insiders say CDC association gave DFCU access to long-term funding to support SMEs, who are the biggest savers and creditors of Dfcu. Why Britain’s CDC is walking out? The aftermath of the DFCU’s controversial acquisition of Crane bank saw several court battles coming over the horizons, as former Crane Bank shareholders challenged both Bank of Uganda and Dfcu on a number of illegalities. Outstanding among others, is former Crane Bank shareholders court suit over property worth millions of dollars, which Dfcu top managers never due diligence to study before taking up the offer of buildings formerly occupied by Crane Bank but owned by another company under the Ruparelia Group. The property suit which would end in dfcu paying out a lot of money in settlements or when the lose the court battle, says a lot of about the move by the British institution to walk out. Meera Investments Ltd, one of the business entities owned by city businessman Sudhir Ruparelia, in February 2018 sued dfcu Bank, seeking to reclaim leasehold titles and developments for 48 banking halls taken over by the latter when Crane Bank was liquidated. In a suit filed before the High Court Land Division, Meera Investments Ltd contends that it is the rightful owner of the land titles and that their transfer to dfcu Bank should have been effected after its consent. Surprisingly, dfcu Bank wrote in its defence in court that no prior written consent was needed from Meera Investments Ltd in order to effect the transfer of the said certificates of title to them by Bank of Uganda (BoU). Proving that they never did due diligence, and largely it was because Crane Bank shareholders were locked out of negotiations, DFCU lawyers Sebalu & Lule Advocates said upon BoU taking over Crane Bank and the eventual transfer of its assets and liabilities to them, Crane Bank’s branch network comprising 48 leasehold land titles was accordingly transferred to them. Meera Investments Ltd however says between 2012 and 2016, it executed several lease agreements with then Crane Bank (now liquidated) and leased several properties to it. Meera adds that the then Crane Bank agreed to pay $6,000 (about Shs21m) as ground rent for each of the properties at the beginning of every year. On October 25, 2016, BoU took over Crane Bank and suspended all members of its board, saying the then biggest indigenous bank was incurably drained financially and posed a systemic risk to the country’s banking sector. The central bank later sold Crane Bank to dfcu Bank in January 2017 at a pantry 200 billion. The international community has put in place stringent corporate governance laws, and also made fraud a seriously punished activity. The move has not only affected banks and business people but also accounting and audit firm, including giants KPMG and PwC. Just this week, PriceWaterhouseCoopers (PWC) has been slapped with a record breaking fine $625 million (appro.sh2,437,500,000,000)for their negligence which led to one of the largest banks, Alabama’s Colonial Bank to collapse in the US state of Alabama. Analysts say, this is one of largest-ever awards for accounting malpractice. CDC management could have evaluated the risk involved in the mistakes made by the Central bank of Uganda and DFCU management in the acquisition of Crane bank and preferred an early exit to safeguard their reputation and funds. Meanwhile, CDC have since asked the management of DFCU to do due diligence and update them with information relating to business operations and risk. This explains the concerns the DFCU investors have in the light of the ongoing battle with the Crane Bank investors as well as Meera Investments. April 7 is the day the genocide started and by the time it ended, millions of Rwandans had fled into neighbouring countries. The genocide against Tutsi was conducted by Hutu radicals. He added that where necessary, such suspects when arrested are extradited on request by the Kigali established or are put on trial wherever they are because they committed crimes against humanity which can be tried anywhere in the world. The governments of Uganda and Rwanda have an understanding to pursue the perpetrators of the 1994 genocide that left about one million Rwandans dead, Rwanda’s High Commissioner to Uganda has said. Maj Gen Frank Mugambagye said this while addressing journalists at his office in Kampala on Friday ahead of this month’s 24th commemoration of the genocide. Gen Mugambage said many of the genocide perpetrators are scattered all over the world and that they must be arrested and tried. He said Rwanda has been providing the Ugandan government information and case files of the suspects to help in arresting and extraditing such suspects to face trials for crimes against humanity. “Rwanda’s justice system is continuing to investigate and information about genocide actors, on who we have sufficient evidence, is given to the governments in countries where they are. We have a number of cases files provided to the Uganda government,” he said. The Executive Director of the Uganda Media Centre, Mr Ofwono Opondo, said it is not a secret that Uganda is cooperating with Rwanda in handling genocide perpetrators so long as legal processes are followed in cases of extradition. Mr Opondo said Uganda’s support to Rwanda started in 1994 through efforts of ending the genocide, helping the Rwanda Patriotic Front that ushered in president Paul Kagame’s leadership and also playing host to Rwanda refugees. “There is no contradiction in what Gen Mugambagye said because we are handling perpetrators of the genocide so long as there is a legal process being followed. Our only problem is about people being waylaid in Uganda and taken back to Rwanda without our knowledge,” Mr Opondo said. Mr Opondo said, however, that for the case of suspects that have been granted asylum through the United Nations High Commission for Refugees arrangement, no arrests and extraditions are permissible under the United Nations legal system since Uganda has no authority over them. He added that such arrests and extraditions can only be done when there is “sufficient evidence and through indictment”. Uganda and Rwanda have recently gone on a collision path and one of the areas of contention is alleged illegal extradition of Rwandan nationals from Uganda. Top police officers accused of participating in the illegal extraditions are currently undergoing trial in the army court. The individuals extradited to Rwanda, however, were not connected to the 1994 genocide but had fallen out with Kigali. He said some foreign powers have supported the perpetrators of the genocide that claimed about one million lives of people, majority of them being Tutsi. "Rwanda has changed for good and forever, and will not be the same, President Paul Kagame," has said. He said this at Kigali Genocide Memorial was during the launch of the 24thcommemoration of people who died in genocide in 1994. “This country has changed; it will never be the same. It has changed for good and forever,”he said. He insisted some foreign powers have supported the perpetuators of the genocide that claimed about one million lives of people, majority of them being Tutsi. He said those countries have extended their influence to some nationals in Rwanda with intentions of seeing what happened in 1994 happen again. “The lives that Rwandans lost because of some people, whether Rwandans or foreigners; we know how to advocate for those lives,” he stated amidst little Saturday afternoon drizzling. President Kagame, who also has refused to leave state power, lits a flame symbolizing the hope of a better political future for this country. Kagame who was flanked by Rwanda’s First Lady among other government officials said: “This is the 24th time we commemorate; it’s like the first time. Commemorating is to start afresh as we remember our nature, families, lives and the country; when we commemorate, we go back in these times,” he reminded.